Light scattering is a non-invasive technique for characterizing macromolecules and a wide range of particles in solution. 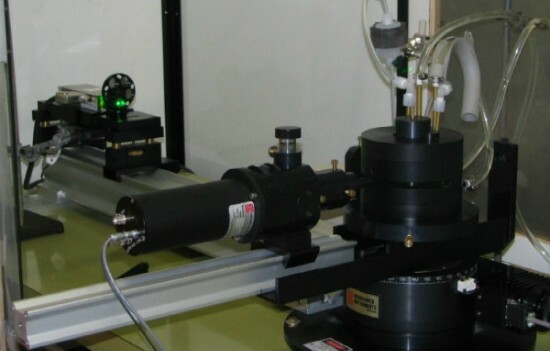 In contrast to most methods for characterization, it does not require outside calibration standards therefore it is an absolute technique. Light scattering experiments can be classified as Static Light Scattering (SLS) or Dynamic Light Scattering (DLS). Both techniques involve the measurement of the intensity of the light scattered from the solution. Light scattering occurs due to the local heterogeneity in the polarizability, ƒׁ, or in the refractive index, n, over the scattering volume. These fluctuations may arise from the fluctuations in temperature, pressure or in concentration. In Static Light Scattering (SLS), also know as “classical” or “Rayleigh” scattering, the intensity of the scattered light is measured as a function of angle. For the case of macromolecules such as proteins of polymers, this measurement can yield the molar mass, rms radius, and second virial coefficient (A2). For certain classes of particles, static light scattering can yield the size, shape, and structure. In Dynamic Light Scattering (DLS), also called Photon Correlation (PCS) or Quasi-Elastic Light Scattering Spectroscopy (QELS), one measures the real-time fluctuations in the intensity of scattered light. This data is used for the determination of the mutual diffusion coefficient of the scattering particles. In dilute solutions, this diffusion coefficient can be further used to estimate the size of particles, and, in the case of macromolecules, the molecular weight and the conformational state of the polymer chains.